WOW, if you thought the Royal Philharmonic Orchestra overdubs ruined Elvis' marvellous originals, you haven’t heard anything yet! From the publicity... He was the King of Rock 'n' Roll, but Elvis Presley could also sing a tender love song as well, as he clearly demonstrates on this CD. 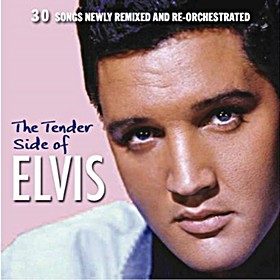 "The Tender Side of Elvis" culls 30 of this iconic artist's best, most intimate recordings and presents them remixed and/or re-orchestrated for a fresh appeal. The sound quality is exquisite! It's a unique listening experience (Yuck!). Get this collectible while it lasts! This "new" album slaps syrupy, badly arranged strings and overdubs straight over Elvis' original recordings turning them all in to middle-of-the road outdated stinkers! However if you want Elvis' fabulous blues of "Give Me the Right' transformed to a syrupy mess, then maybe this is for you. Of course all the songs are "Public Domain". Even Priscilla wouldn’t authorise this!